Samoa in the South Pacific is a country with ancient traditions and strong cultural roots. Although Samoa attracts many tourists to its paradise beaches, it remains on the United Nations list of least developed nations and especially in the urban centres levels of deprivation have increased. By volunteering on a Care and Community project in Samoa, your group will be able to not just help the local communities of this proud and welcoming island nation but you’ll also be helping the children of Samoa with a variety of activities. Volunteers with any relevant qualifications and experience are welcome but you do not need to have either to volunteer. Energy and a commitment to the local children and the work at hand should see you through. Depending on your skills and interests, as a volunteer you will have the opportunity to get involved in a variety of activities that will benefit the local community. Samoans are always eager to learn and as a volunteer you have the chance to exchange ideas and stories. Using your skills and knowledge, your group will teach at the local school in the morning and do other activities later in the day. The school is the hub of the community and working at the school will mean you will be a part of the village life from the grass roots up. You will learn to sing like a Samoan, dance like a Samoan and speak like a Samoan! During the Samoan school holidays, we offer groups the chance to work in two libraries, one being located on Upolu Island in Apia and the other in Salelologa on Savaii Island. These projects are split so that the group will take on a project to paint and repair the library as well as provide literacy and reading programmes for the local children. Other activities that volunteers may assist with later in the day include a drama group, gardening, exercise classes and reading classes for children and adults. Groups are also able to create specific workshops that can benefit the community, for example, vegetable growing, sustainability schemes or healthy eating and living programmes. Our Care placements are based in and around Samoa’s capital, Apia, on the coast of Upolu island. Groups work in kindergartens and centres for children with special needs. Groups will help to provide a helping hand to the local kindergarten staff by looking after and caring for the children. It is also the perfect opportunity for any skills and interests that the group or individuals have to be put to good use, whether it’s teaching games and songs to children, or arts and crafts – your suggestions will always be well received. By showing initiative and enthusiasm the options available are endless. The work with the disabled children can be demanding, but also very rewarding. Spending one on one time with a child with extra needs can really help to boost their progress, whether it be helping them to write their name, or playing a game in the garden. Projects Abroad also work with the Samoa Victim Support Group who provides much needed support and shelter to victims of sexual and domestic abuse through the establishment of three centres. The people that attend these centres appreciate all the assistance they can get as they usually have nowhere else they can go. Your group may find yourselves spending time with the young mothers and helping to look after their babies, providing guidance on health and hygiene, running classes for the children who are not attending school or just being a general helping hand around the centre. 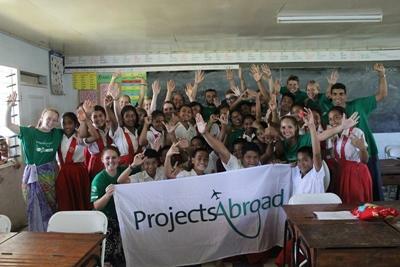 Projects Abroad also runs an activity programme once a week for the Samoan children who are forced to sell on the streets. The 7 to 17 year olds have lived tough lives, usually being forced to stay out late selling to bring home enough money for the family. The idea of the activity programme is to provide these children with a day every week where groups and volunteers can help them with their homework teach them songs and play games as a way to offer them a space in which they can have fun and be children who laugh and enjoy life. We aim to help them understand the importance of going to school, and to equip them with the skills to help get them off the streets in the future. Whether you are helping children with disabilities gain more confidence, helping older children with school homework, reading a story to the younger ones or supporting young mothers and their children through difficult times, you will be an essential part of their development. Please let our local staff know about any particular skills or preferences you may have when you apply. You can read more detailed information about the aims of the project in our Samoa Care Management Plan. 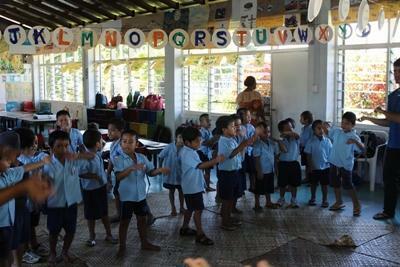 Care groups in Samoa receive regular workshops run by the Projects Abroad team. The workshops will provide you with a valuable insight into the care system in Samoa and the background of your placement. You will also discuss ideas for activities, including arts & crafts and games to try at your care placement. Volunteers normally live with a host family within a short bus ride from their project but, depending on the size of your group, a local hostel or hotel can be arranged if preferred. Living in the village you will become part of the community and will get to learn and understand the way Samoans live. During your group’s stay you’ll experience the Samoan way of life, from eating and cooking their food, to going to church, to understanding the village chief system. Samoans are famous for their hospitality and you will quickly become part of the family. All villages are on the main island of Upolu, and may be up to one hour drive from the capital Apia. Due to being in a more remote location, the minimum age for this project is 18 years old.